Police have concluded investigations in a case that Ugandan woman Lillian Kaitesi alleged mistreatment by her husband, a US national. 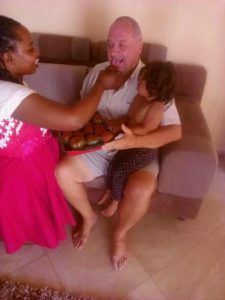 Ms Kaitesi first came out on social media with a child claiming that her husband Paul Mathias Rogers had mistreated her to the extent of pushing her out of their home like a destitute. In Ms Kaitesi’s narration, Rogers took her to the US where he married her but before the marriage he asked her to sign a prenuptial agreement. Kaitesi says she first refused to sign the agreement having been warned by Rogers’ friends in the US. Her refusal to sign the prenuptial made Rogers send her out of his home, refusing to give her a ticket to return to Uganda. She then went and lived with a friend of Rogers’ but after a while, she signed the agreement and the got married. The mistreatment, in Kaitesi’s narration, did not stop, a situation that forced her to call home, asking her relatives to mobilise resources for her to return home. 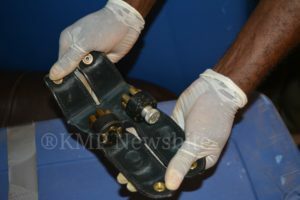 Kaitesi continued to allege that Rogers, while in Uganda was involved in a number of illegal activities including importation of guns and drugs among other illicit items. When Kaitesi first came out, social media users attacked her saying she was telling lies against the man. Claims on social media were that Kaitesi and Rogers’ woes were about property which Rogers had bought in Uganda. It was alleged that when the couple fell out in the US, Kaitesi quickly rushed home to take possession of the house and land which Rogers had bought in her names since he was non-citizen and as such could not own land by law. 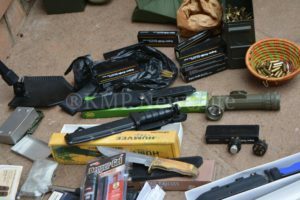 Police, acting on information provided by Kaitesi raided Rogers’ home in Bwebajja, on Entebbe Road, where, according to Kampala Metropolitan Police news site, they found an assortment of dangerous and illegal arms. Police said a General Enquiry File 001/2018 has been opened to ascertain circumstances surrounding Rogers’ possession of these military equipment. Police also revealed that in March last year, Immigration officers at Entebbe International Airport confiscated a rifle which Rogers had brought in the country illegally. “Police are also working with Immigration officers on another case against the suspect after he was found with expired passports,” the statement reads.